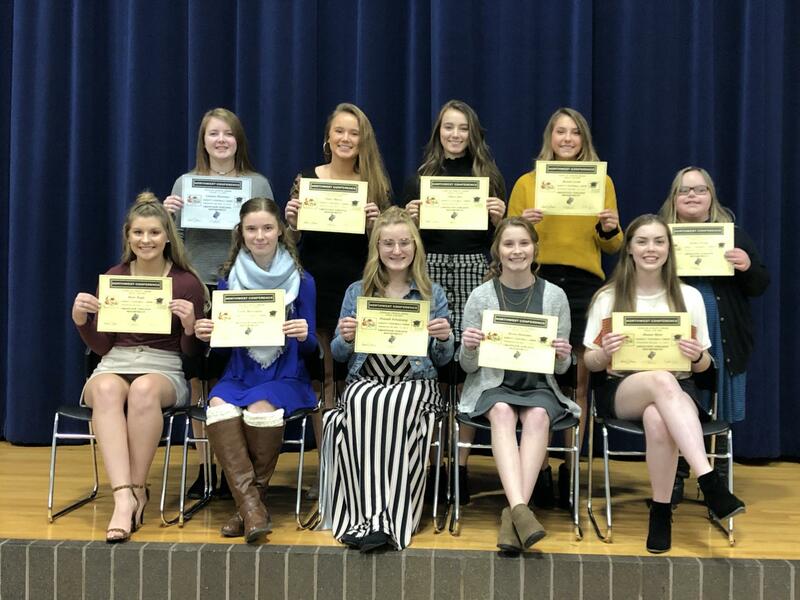 The Crestview Boys’ Basketball and Basketball Cheerleading programs concluded their season with boys’ basketball head coach Jeremy Best, along with his coaching staff, and cheerleading coach Halle Beougher recognizing their teams’ accomplishments throughout their season that ended with a State Championship. 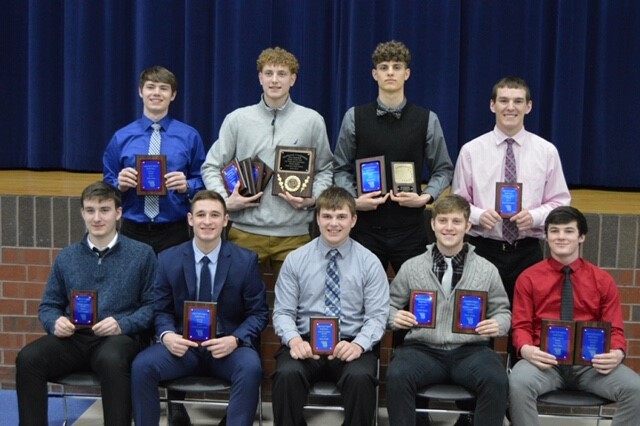 Basketball Scholar Athletes include: (l to r) Row 1: Brock Stauffer, Colton Lautzenheiser, Kole Small, Derick Dealey, and Drew Kline. Row 2: Carson Kreischer, Wade Sheets, Kalen Etzler, Javin Etzler and Brant Richardson. 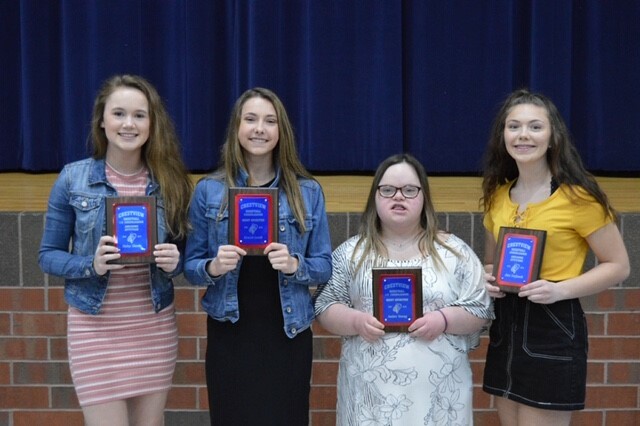 Cheer Scholar Athletes include: (l to r) – Nevaeh Pruett, Lexi Harter, Ellie Vining, Maisee Short, Rosie Bogle, Chelsea Taylor and Alex Stefanek. Basketball Special Awards: (l to r) Row 1: Brock Stauffer (Knight Pride Award), Colton Lautzenheiser (Hustle Award), Kole Small (Knight Pride Award), Derick Dealey (70% Free Throw Club, Knight Toughness Award), and Drew Kline (NWC 2nd Team, Most Assists). Row 2: Wade Sheets (NWC Honorable Mention, Hustle Award), Javin Etzler (NWC 1st Team & Player of The Year, AP Northwest District 1st Team, District 8 Awards 1st Team & Player of the Year, All State 1st Team AP & Division IV Player of the Year OHSBCA, Rebound Award, 70% Free Throw Club, Free Throw % Award, Offensive Efficiency Award), Kalen Etzler (NWC 1st Team, AP Northwest District Honorable Mention, District 8 Awards 1st Team, Offensive Efficiency Award), and Brant Richardson (Knight Pride Award). Cheer Special Awards: (l to r) – Haley Sheets (Awesome Attitude JV), Kenzie Leeth (Most Spirited Varsity), Amber Young (Most Spirited JV), and Alex Stefanek (Awesome Attitude Varsity).